In the Muslim discourse, there is a feminist sentiment growing among Muslimahs in the world. In the Philippines where Muslims are a minority, it is necessary to know their sentiments to contribute to the development of the gender discourse on Muslimahs. 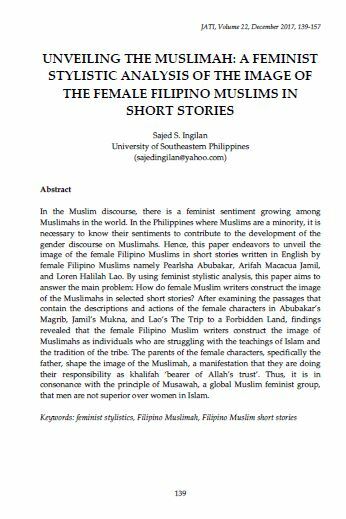 Hence, this paper endeavors to unveil the image of the female Filipino Muslims in short stories written in English by female Filipino Muslims namely Pearlsha Abubakar, Arifah Macacua Jamil, and Loren Halilah Lao. By using feminist stylistic analysis, this paper aims to answer the main problem: How do female Muslim writers construct the image of the Muslimahs in selected short stories? After examining the passages that contain the descriptions and actions of the female characters in Abubakar’s Magrib, Jamil’s Mukna, and Lao’s The Trip to a Forbidden Land, findings revealed that the female Filipino Muslim writers construct the image of Muslimahs as individuals who are struggling with the teachings of Islam and the tradition of the tribe. The parents of the female characters, specifically the father, shape the image of the Muslimah, a manifestation that they are doing their responsibility as khalifah ‘bearer of Allah’s trust’. Thus, it is in consonance with the principle of Musawah, a global Muslim feminist group, that men are not superior over women in Islam.